When I posted my metal flake FAIL I heard from my new friend Chris at Chaotic Customs. 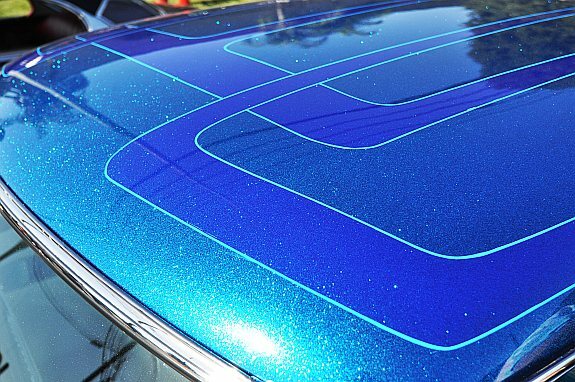 He made a great how-to story about creating a custom metal flake roof for your ride. Chris came through with a how-to video for shooting metal flake and he used a cheap Harbor Freight gun! I hope we can all afford $30-40 for a gun and if you watch, Harbor Freight has 20% coupons available almost all the time. Chris also shows a few more details about setting up the gun and what he literally throws away when using the HF gun. It’s a fun video with great commentary… Thanks a million for the video Chris! Thanks again Chris! To see some of Chaotic Customs full builds, including custom paint, check out their 1965 Thunderbird and more. Glad we could help! Let us know how your next metal flake project turns out!